Fearing an adults only rating would hamper sales in one of the game's biggest markets, Blizzard is censoring the South Korean version of StarCraft II, recoloring blood and removing vulgar language to secure a more family friendly rating. In April, Korea's Game Ratings Board issued an adults only rating for StarCraft II, the sequel to the beloved real-time strategy game that's something akin to a national sport in the country. Now Korean e-sports website FOMOS reports that Blizzard has made the changes necessary to bring the rating down to a 12+, the same rating enjoyed by the original game. 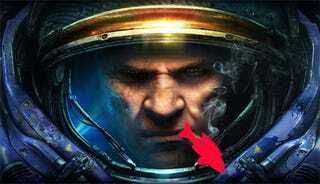 A translation of the article from the Team Liquid forums reveals that Blizzard changed the color of blood in the game from red to black to help lower the age rating, along with removing references to smoking and vulgar language in the game's cut scenes. "Since StarCraft 2 was originally developed to be a game adolescents could enjoy, we're very pleased with the Game Rating Board's decision," said Blizzard, via the translation. "In the remaining time until StarCraft 2 goes on sale, we'll do our best to continue to perfect the game so that even more fans can enjoy it." Blizzard is still considering whether to release the game in two versions in South Korea - adults only and all ages - or simply stick with the censored version of the product.